Wouldn’t it be great if every landscape project we took on went according to plan? The plan being the direction we hope every new project which we price, win and execute will take. How often have we reached that point in a project when we wish we could turn the clock back and save a lot of time, sanity and money by not pricing or starting it in the first place? There has to be a good business opportunity in the niche market of the sale of landscape crystal balls. That said, I’m going to keep this article positive (having found it often too easy, over the last few years, to write about negative issues and topics of survival and failure). I’m going to discuss a recent landscape project which went well for all concerned. 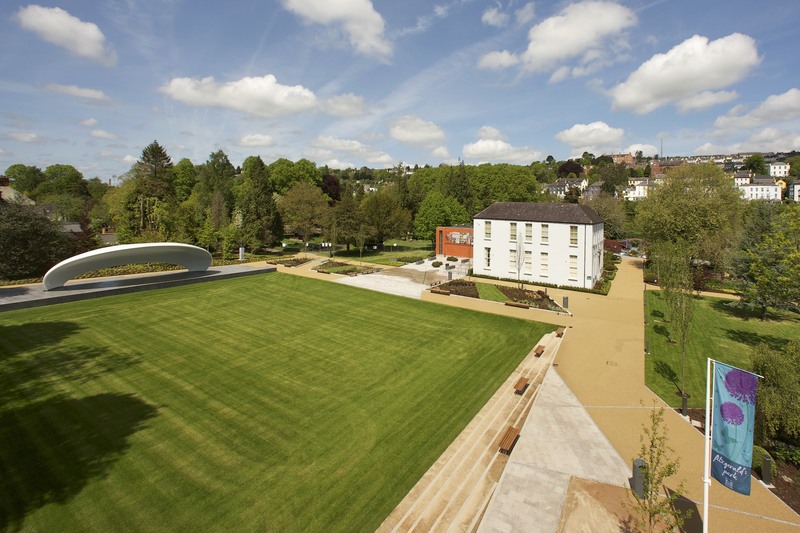 The project was the Mardyke Gardens (a redevelopment of part of Fitzerald’s Park in Cork). Generally city, generally well known because of its media attraction due to the fact that some of the major elements of the scheme were part of Diarmuid Gavin’s Sky Garden entry for the Chelsea Flower Show in 2012. Cunnane Stratton Reynolds (Landscape Architects) designed the scheme for Cork County Council. Speaking from the landscape contractors point of view, I’m going to reflect on this project and explain why, I think, this can be used as an example of a landscape contract which followed simple and realistic steps from start to finish. Firstly, in order to get the opportunity to tender for the contract, we had to prequalify. This is a procedure which can be laborious at times and exists for most tenders in the public domain. It ensures that the client, Cork County Council in this case, is selecting from suitable specialist contractors and satisfies issues such as health and safety record, similar works experience and has the ability and resources to complete the project. This element addressed, the landscape tender was priced for the various main contractors who in turn would have prequalified to spearhead the project. Cumnor Construction Ltd was the successful contractor and by their own admission, hadn’t carried out other contracts which had such a high proportion soft landscaping relative to the overall project. Because of this, they were keen to get a full understanding of the scope of works from an early stage. Having been successful in winning the contract from Cumnor in September 2013, a meeting was set up with their project management team, the landscape architects and ourselves to establish a programme for the works, which were to be completed in May 2104. We were invited to contribute in compiling the main programme of works and guide on timing of planting and co-ordination around difficult construction elements on the project. A big challenge for our company was the fact that the project was in Cork City and we are based in Dublin, and we had estimated that there would be about eight to ten weeks work for us over the period of the main contract. I am of the opinion that working away from the comfort of the normal workbase forces you to be better organised and put more valuable resources into advance planning. We used a combination of our own experienced staff for project management, machine operations and planting, and supplemented this with locally sourced labour through a recruitment agency. The plants for the project came from two sources. Nangle & Niesen had stored and maintained most of the original plants from the Chelsea garden including a large quantity of Buxus and Taxus spheres (up to 1.8m diameter) and semi mature Carpinus and Betula and about 1,000 plants in pots ranging from 5ltr to 30ltr. Annaveigh Plants supplied all the new material specified which included ‘Box Head’ Tilia, semi-mature trees and a huge amount and range of herbaceous plants, shrubs and grasses. All key plants were inspected on the nursery prior to delivery to site and in sufficient time in advance of this delivery, comma added to allow for possible changes which might happen. It is always so important to have an honest relationship between the landscaper, the nursery supplier and the landscape architect/designer. In a period where there is much discussion and controversy over works (and especially the planting element) being carried out below specification, this relationship instils confidence which spreads throughout a project. With the Mardyke Gardens project where there was such a large quantity and wide range of material, the main contractor had initial concerns and uncertainty about this element, and given the attention which the project had been drawing from the media and public this was perfectly understandable. However, the trust between all parties was established from the very beginning and maintained throughout the project. From a common sense point of view, it stands to reason that this positive relationship has a huge impact on the financial aspect of the project when it comes to pricing additional works and agreeing accounts. Apart from regular contact between all parties involved, we attended monthly meetings on site to assess the programme and adjust same if required. As can be expected but not desired, we lost valuable time in the middle of the planting season due to wet weather creating unworkable conditions, but again it was reassuring for us that the design and project management teams fully accepted this and allowed best practice to prevail. Far too often, projects which would appear to have all the ingredients of being completed successfully both from an aesthetic as well as a financial point of view, fall short of expectations. The reasons for this become irrelevant and difficult to correct if it leads to a situation where there is financial loss and/or damaged reputation. We must remember that, as landscape contractors, we are specialist subcontractors and we do possess a lot of specialist skills and knowledge (even if others don’t always appreciate it) and once we don’t abuse this the rewards will be obvious and worthwhile.